Here's a cute YouTube Video from February 2010 when Mr. Boomer was not quite sure about Marie's advances. These days he has resigned himself to her sidling up to him, pushing his ear up (which is bigger than her head), and licking his ear canal. Doesn't that make you squirm? 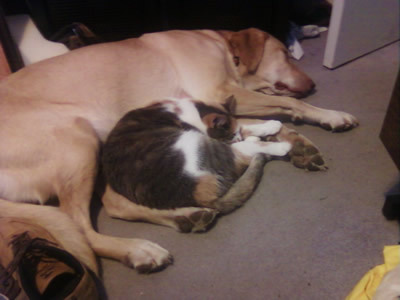 Then she curls up against him and they take a nap together. Just goes to show you ladies - if you are persistent, that guy will give in sooner or later. Marie passed away at the end of 2014 after a long ordeal with cancer that she fought valiantly. She is so missed.